Plans to expand a whisky firm with a new distillery and visitor centre have been given the go ahead. 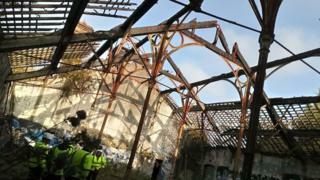 Penderyn Whisky is to redevelop a disused building at the historic Hafod Morfa Copperworks site in Swansea. The Aberdare-based whisky firm hopes construction will begin at end of this year with the facility opened by 2022. The Lottery Heritage Fund awarded £3.75m towards regenerating the 19th Century Powerhouse building into the visitor centre and distillery. The old copperworks site stretches over 12 acres on the west bank of the River Tawe and is linked to the city centre by the new Morfa Distributor Road. Other major plans for Swansea include a new 3,500 seater arena as part of a city centre revamp, and a cable car on Kilvey Hill.